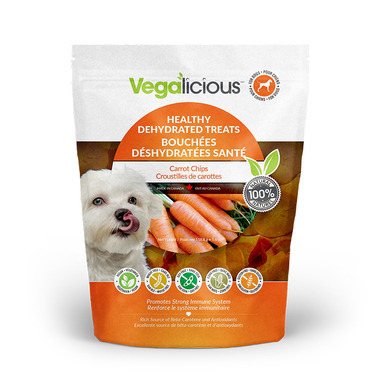 Vegalicious Dehydrated Treats are ideal for dogs with limited ingredient diets. These tasty treats are vegan and free of wheat, soy, corn, gluten, animal protein, and dairy. These Healthy Carrot Chips will be irresistible to your pups! A perfectly wholesome and natural way to treat your dog. My small dogs love these. The treats provide some decent chew, smell intensely of carrots, and are small so I don't have to cut them up (like the squash rings). I love giving them whole foods and not having to worry about one of them being sensitive to a random/unknown ingredient too.